Life in the modern age has become a life of non-stop activity and high demands, which often lead to stress and lack of inner peace. If you want to be stress-free, and restore tranquility and balance, mindfulness can help you do that. Mindfulness is the act of maintaining awareness of our thoughts, feelings, physical sensations, and the world around us. It is the process of paying attention to what is happening to us and around us in the present moment. The act of being mindful prevents unrelated thoughts from distracting our attention. When we are mindful, we do not dwell on the past or worry about the future, and not allow worries to control our mind. When you adopt mindfulness as a way of life, your mind learns to calm down and relax. Imagine that you are traveling in a train at an extreme speed, and another train is traveling on nearby tracks, in the opposite direction. Would you be able to see the wagons of the other train in detail? No, you will not be able to see them clearly, since both trains are traveling fast. Everything would look blurred. It is the same when your mind is speeding from thought to thought, from one activity to another, you hardly notice details, and you hardly pay attention to anything. Practicing mindfulness will help you become aware of your life and of your actions. It will help you focus on one thing at one time, and this action would calm down the hectic activity of the mind, and make you enjoy life more. When we adopt the practice of mindfulness, we learn to pay attention to our daily experiences, learn from them, and often enjoy them. The mental attitude of being mindful also helps us to carry out our tasks and chores in a more efficient way and with fewer mistakes. Mindfulness helps us enjoy life more, because we become aware of our actions, and focus on whatever we are doing. Being more attentive enables us to enjoy the food we are eating, the scenery we are looking at, the book we are reading, and the conversation we are conducting. Mindfulness helps us see details, and be aware of things that otherwise, we would have missed. It can help us when we study and when we work. It helps us when we go for shopping and when we exercise at the gym. It also helps us when we do business. We carry out most of our daily activities automatically and absentmindedly. We eat, drink, shower, cook, clean the house, and carry out tasks, and even work or study, without paying much attention to what we are doing. We can change this behavior and become more attentive. This would improve the quality of our life. Being engrossed in negative thoughts and worries, disturbed by what people say and do, and allowing the environment to affect how we think and feel, build up stress and unhappiness, and waste precious energy and time on insignificant matters. You are driving your car or traveling by bus, eager to arrive at your workplace on time. There is heavy traffic, and people hurrying all over. This makes you stressed and impatient, and your mind gets busy with thoughts about the meetings you are going to miss or what excuses you are going to tell your boss for being late to work. Your stress and worries distract your attention, and if you are driving, they do not allow you to focus on the road. When you finally arrive at your destination, you feel tired, stressed and exhausted. 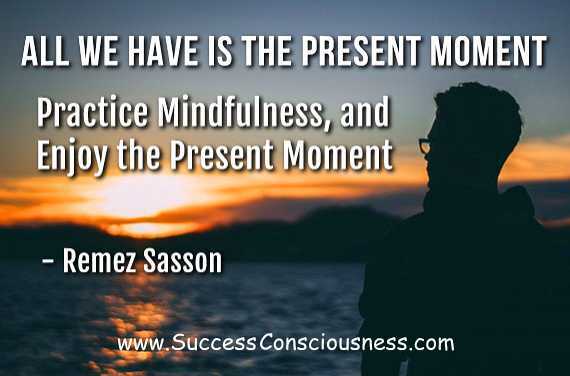 However, if you practice mindfulness and focus on the present moment, it will be difficult for worries and negative thoughts to access your mind. This would also prevent stress from building up. There will be no impatience and stress, and you would arrive relaxed and happy at your destination, instead of tired and exhausted. You save your energy and enjoy the trip when traveling by bus or train, if you try to focus your attention on the scenery and enjoy it, instead of making room in your mind for worries and meaningless thoughts. You will stay calm and relaxed, when you try to look dispassionately at your thoughts, and avoid being swept by the emotions they might awaken. When you direct your attention to what you are doing at the present moment, you do not get stressed or worry about the work or tasks awaiting you. How many times have you walked through a park, without noticing the singing birds, the beautiful flowers, the drops of dew on the grass, or the sound of the rustling leaves? There are many small things in our everyday life, which can create joy in our life. There are many things that can help us enjoy the present moment. However, we often miss them, because we are not mindful. Mindfulness enables us to appreciate the sunshine and the sunset, the waves on the beach, or the beautiful slice of cake on our plate. It makes us hear what people say, helping us become good listeners, and this improves our relations with people and make us more popular. When we direct our attention to what we are doing, we enjoy more the food that we eat, and notice its taste and good smell. We enjoy the book we read, because we don’t just read a few words here and there, hardly paying attention to what we are reading. When we focus our awareness on our actions, time flies more quickly, and even boring tasks become enjoyable. If you have the time, learning and practicing a few concentration exercises and studying meditation, would be most helpful. However, even without them you can learn to practice mindfulness. All you need to do is to strive to pay attention to whatever you are doing in the present moment. When you eat, focus on eating, when you drink, focus on the act of drinking, when you work, just focus on your work, and when having fun, just enjoy the fun, without thinking of other things. Do one thing at a time, with your full attention on it. Yes, your mind will constantly wander away, because this is what it is accustomed to do. However, you can teach your mind new habits. Every time you become aware that your mind wandered away to other thoughts, just attempt to bring it back to your current moment activity, with no impatience, tension or anger. As you continue practicing being mindful and attentive, gradually, your patience would grow, as well as your ability to be aware of the present moment and your present activities. You will notice that fewer worries are disturbing you, your mind is becoming calm, and you are feeling more peaceful, balanced stress-free. If you are interested in simple working methods to have more control of your attention, calm the restless activity of your mind, and become more mindful, consider reading and studying one or more of the three books below. Why I Can't Focus My Mind and What Are the Reasons?